Goleta's oldest best kept secret! ​are $9.95 the entire month of April! CHECK OUT OUR NEW SELECTION OF WAGYU PRODUCTS WE OFFER IN THE MEAT MARKET! Did you know we offer corporate catering? Let us do the work for you. ​A couple of years back, I found myself yearning to roast a porchetta for Christmas Eve. There was no question about my first move: I contacted the crew at the Country Meat Market in Goleta, inquiring whether they’d be able to arrange such a delicacy, in which pig flesh is deboned, stuffed with seasonings, and rolled tightly so that the fatty skin can be wrapped around the outside. They were game — in fact, they rolled two, one for themselves — and the porchetta was a hit, even if the thick rib eye I bought there for Christmas Day sorta stole that holiday’s show. Though I vaguely recall a visit or two while living in Isla Vista as a UCSB student in the 1990s, when I worked at the now-closed Little Caesar’s down the street, I’d almost completely forgotten about this hidden gem of a butcher shop/sandwich counter/catering company next to the Zodo’s bowling alley on Calle Real. But then I moved out to the Good Land suburbs in 2013 and now find any excuse to peruse their cuts. From the pre-marinated chicken halves (great on a wood fire pressed under a brick) and the slightly dry-aged New York strips (thyme and butter-basted in a cast-iron pan for sure) to the free pound of burger meat you get with a $40 purchase and Axxess card (sweet roll sliders, of course) and diverse assortments of meats I’ve yet to buy (quail, crown roast pork, buffalo tenderloin), Country Meat Market & Catering is a candy store for discerning carnivores. It’s also one of the last of the old-school, independent butcher-shop breed that was a critical component of the American food landscape until grocery chains gobbled up that market. Owner Steve Gully remembers those times vividly. When his family moved from Milwaukee to Goleta in 1973 — one of 400 families that came out to work at Delco Electronics — they immediately started buying from the Meat Market, which was founded a half century ago by Frank Serbus. He started working catering gigs with the Meat Market in 1988 and was running that side of the business within a few years. “Pretty much everything we did involved a barbecue,” said Gully of the original catering strategy, which he’s evolved into a diverse range of offerings fit for all types of celebrations, from Hawaiian, Mexican, and Italian menus to prime rib, coq au vin, and surf ’n’ turf. It’s now two-thirds of the business, with as many as three events per day, every day of the week, and Gully can fire up a full party with just six hours of notice (though that’ll cost you more!). In 2000, Serbus sold the business to 26-year employee Craig Brock, and Gully figured that Brock would eventually sell it to him, never guessing it would be only four years later. That was 2004, the same year Gully and his wife, Michelle Taylor, bought a house and had their first kid. Though he happily jokes about giving lessons on how to go a million bucks in debt overnight, the Meat Market has thrived under Gully’s leadership. He now employs about 10 people full-time and 10 part-time, and just signed a multiyear extension on the lease. Though rib eye remains king of the cuts, Gully sees meat trends come and go, thanks in large part to newspaper articles or television shows highlighting a particular roast. Cue my porchetta request, which they tackled with gleeful expertise. 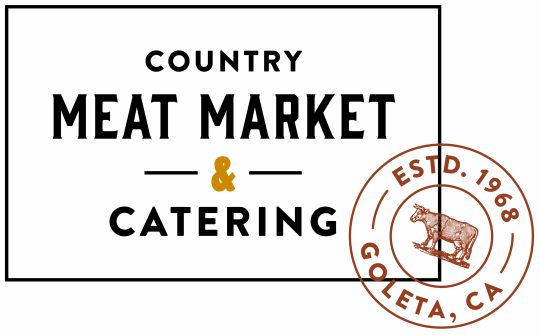 4·1·1 Country Meat Market & Catering is located at 5925 Calle Real, Goleta. Call (805) 964-3811 or visit countrycateringcompany.com.